The Chicago Symphony Orchestra canceled Monday a second week of performances after talks with striking musicians failed to reach an agreement on a new contract. Negotiations resumed over the weekend, but failed to reach an agreement, the Chicago Symphony Orchestra Association said. No additional talks were scheduled between the two sides as the labor dispute within one of the classical music world's most high-profile institutions entered its second week. Five concert programs were canceled through March 25. All concerts were canceled last week as well. Orchestra members demanded the company maintain their traditional pension plan, while management wanted to switch to retirement savings accounts similar to those widely used in the private sector. Musicians also sought a bump in pay to better compete with other world-class American orchestras. Over the weekend, the musicians said they had provided calculations to orchestra management that showed maintaining their current pension plan would be cheaper than retirement savings plans. The orchestra's leadership claimed traditional pension costs have skyrocketed and will continue to rise. They have said changes are necessary for long-term sustainability. The labor dispute has cast an unflattering spotlight on one of the world's most venerated orchestras, amid general concern in the classical music world over the sustainability of many institutions. 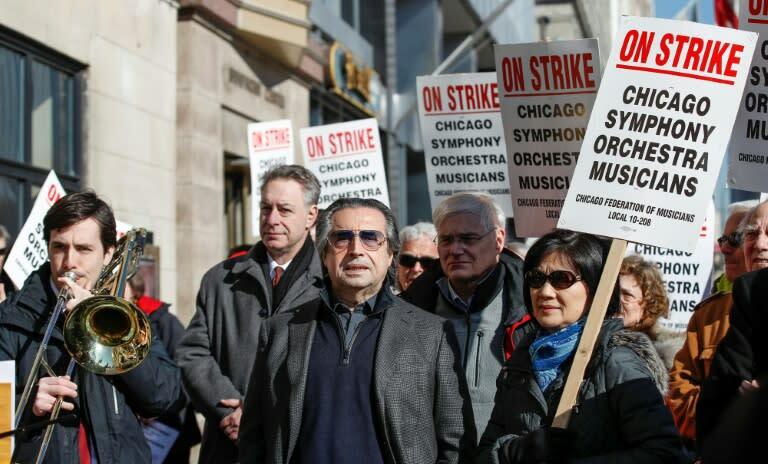 "The entire world -- the musical world -- is listening to what happens in Chicago," the orchestra's music director Riccardo Muti said last week at a news conference held to show support for musicians.